Rare material from John Fahey is set to be exhumed on the upcoming box set ‘John Fahey: Your Past Comes Back to Haunt You (The Fonotone Years 1958-1965)’. 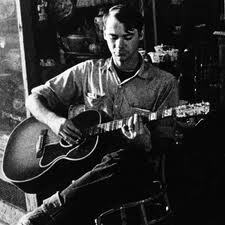 Very much a neglected figure, John Fahey is extremely important to the evolution of American music. An important figure in the blues and folk revival, he helped rediscover performers long since thought lost to music. His own recordings were an extraordinary mixture of technical virtuosity and emotional depth. Releasing his debut album ‘Blind Joe Death’ in 1959, the guitarist seemed to arrive fully formed. However he did make earlier recordings, laying down instrumental tracks for the Fonotone label. Issuing in tiny quantities, the songs were pressed onto 78RPM discs. Unusual even for the time, the Fonotone label handled a series of John Fahey tracks between 1958 and 1965. It is this period which forms the spine of the new box set (via Tiny Mixtapes). ‘John Fahey: Your Past Comes Back to Haunt You (The Fonotone Years 1958-1965)’ promises countless rare material, including some cuts which have never been released on any format. Dust-To-Digital are to handle the release, which will contain a total of five CDs. Joe Bussard controlled the Fonotone label, and his archives have proved to be an invaluable addition to the Fahey discography. Containing 115 tracks, the upcoming box set is edited by fellow guitarist – and Fahey collaborator – Glenn Jones, with the full approval of the late musician’s estate. Alongside a host of musical rarities the upcoming box set also includes an 88-page book with essays and analysis, reproductions of those Fonotone labels and rare photographs donated by Jane C. Hayes — Fahey’s mother. 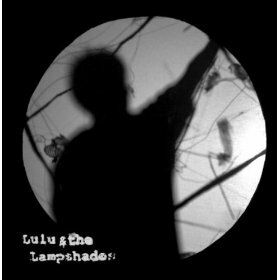 However stay with me if you were worried that there hadn’t been a quirky folk-pop group for ages, one where they sing songs about Cherry Coke and pedal bikes and play them on a variety of make-shift instruments, then fear not: this Lulu and her Lampshades are here to save the day. Their music is so cheery they could use it to advertise fun. 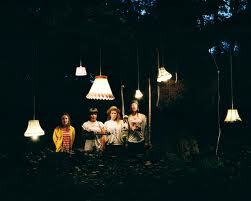 They perform alongside dancing lampshades, hence their name. And their new single, Feet to the Sky, recalls the theme to 60s kids TV puppet show Camberwick Green, so if you’re not in the mood for jolly and jaunty, you should probably alight here. But it would appear to be to a lot of people’s taste, although that could be down to simple masochism: the YouTube video for their song You’re Gonna Miss Me, now known as “Cups” (see below) eaturing two members in a kitchen, wearing pyjamas and singing the song while beating out its rhythm on empty plastic cartons, has gone mega. Now some of you will have remembered this video from a previous post, now the rest of the world is catching up!! They started life when they formed a pretend group comprising Luisa on GarageBand and Heloise on “air-glockenspiel”. Eventually they drafted in Jemma, the one who has been compared with Patti Smith and knows about chords and notes and stuff, and Dan, who makes strange facial expressions as he bashes things, not always drums. Now they’re laying waste to venues the length and breadth of, well, Camden, mainly, stomping their feet and clapping their hands and generally smiling and being, ugh, IN A GOOD MOOD as they tout their winsome wares. Sometimes their music is jazzy and swingy with shades of the Puppini Sisters. Other times it isn’t. Often it reminds us that there is nothing remotely new under the sun: about 25 years ago, there was a micro-movement in London of young acts who would incorporate elements of folk, skiffle and bluegrass, groups with names like the Shillelagh Sisters, the Boothill Foot Tappers and one called Pogue Mahone, who later shortened it to the Pogues. The latter were fronted by a gentleman by the name of Shane MacGowan. He didn’t smile much or clap his hands, although he would regularly smash household objects over people’s heads. Still does, apparently. The truth: Genius is probably stretching it. And joyous? Well, that’s a matter of perspective. But they’re certainly a pop-folk act. Most likely to: Carry on performing even during a power cut. Least likely to: Bite the ear off an audience member. What to buy: Feet to the Sky is released by Voga Parochia on 26 October. File next to: Boothill Foot Tappers, Kate Nash, Peggy Sue, Melody Melodica & Me. They have a new four track EP out titled “Cold Water” which features a new recorded version of the now famous “Cups” song. Somewhat amazingly it has taken until the recent relaunch of her fourth album from April 2010 for the music of Little Miss Higgins to catch my radar. 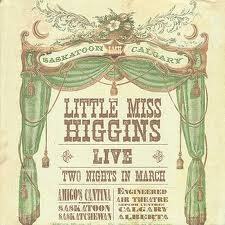 Little Miss Higgins (aka Jolene Higgins) was born in Brooks, Alberta. The blues, folk and jazz performer was however in fact raised in Independence, Kansas prior to moving back north. Now based in Saskatchewan the singer-songwriter strikes out in a wonderful, cultured style as she showcases her fine work on guitar as well as vocals. Supported by her partner, Foy Taylor (guitar), Joey Lorer (upright bass), Joanna Miller (drums), Jimmie James McKee (trumpet) and others the music contains a great vibrancy as her and the band swing through a varied set of tunes including some splendid ones of a ragtime nature. There is a rare live feel to the new album “Across The Plains” the 1930s come to mind as she continually prompts and probes boundaries to produce a huge joyful sound. ‘Glad Your Whiskey Fits Inside My Purse’ could just as easily come from America’s infamous prohibition era as the listener is taken on a whistle stop trip through that period in time. As a songwriter, she has been influenced by a range of artists from Memphis Minnie, Billie Holiday, Big Bill Broonzy to Joni Mitchell, Dolly Parton and Bob Dylan. 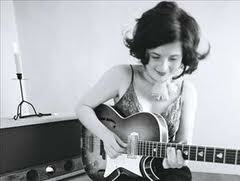 Her first two studio albums “Cobbler Shop Sessions” (2006) and “Junction City” (2007) superbly showcase Little Miss Higgins as a highly-developed songwriter as well as a remarkable country blues performer in a style gracefully highlighted by her partner, guitarist Foy Taylor and occasionally a handful of other roots musicians. 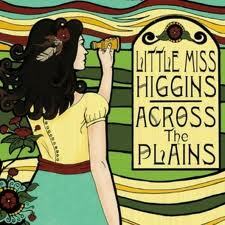 With her newest release, “Across The Plains” and partner Foy Taylor, Little Miss Higgins now enters international waters with a tour to the UK in the spring of 2011. 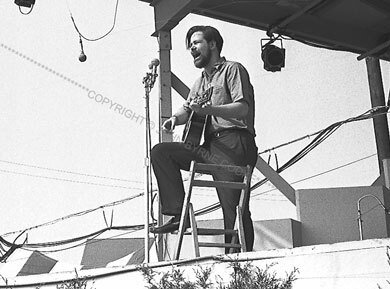 John Fahey (February 28, 1939 – February 22, 2001) was an American finger style guitarist and composer who pioneered the steel-string acoustic guitar as a solo instrument. His style has been greatly influential and has been described as the foundation of American Primitivism, a term borrowed from painting and referring mainly to the self-taught nature of the music and its minimalist style. Fahey borrowed from the folk and blues traditions in American roots music, having compiled many forgotten early recordings in these genres. He would later incorporate classical, Portuguese, Brazilian, and Indian music into his signature style. Fahey wrote a largely apocryphal autobiography and was known for his coarseness, aloof demeanor, and dry humour. He spent many of his latter years in poverty and poor health, but also enjoyed a minor career resurgence with a turn towards the more explicitly avant-garde. He died in 2001 due to complications from heart surgery. During his early days of recording he would sometimes insist on being known as “Blind Thomas” which was an early sign of his habit of inventing “blues personas”, later when he made some money he would be a champion for lost blues singers. 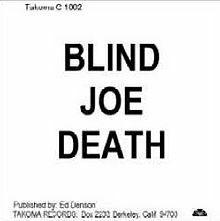 Blind Joe Death was his 1959 debut album, however, ultimately there ended up three different versions of the album. The original self-released edition (above) ran to fewer than 100 copies and as such is obviously extremely rare. It was one of the first albums recorded and produced by an independent artist being as it was released on Takoma Records, Fahey’s own creation. It was not marketed and made no impression on the American record-buying public. The album had a first re-release it was however not a re-pressing of the original release as Fahey had in 1963 decided to to re-record much of the material, as he felt he had become a much better player. This second pressing claims that “On Doing an Evil Deed Blues”, “In Christ There Is No East or West”, “The Transcendental Waterfall”, “Desperate Man Blues”, and “Uncloudy Day” are 1964 rerecordings and the rest (“St. Louis Blues”, “Poor Boy Long Ways from Home”, “John Henry”, “Sun Gonna Shine in My Back Door Someday Blues”, and “Sligo River Blues”) are the original 1959 versions. 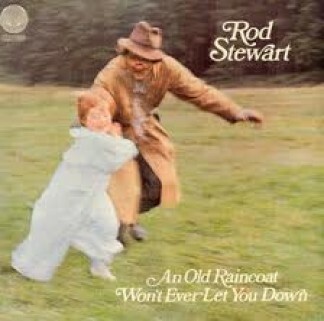 “Uncloudy Day” was actually the same recording, as was “St. Louis Blues” in an edited version. The 1959 album contained a version of Blind Blake’s “West Coast Blues”, which (despite being rerecorded in 1964) was not included on the album. To fill the gap, the new version of “Transcendental Waterfall” was extended to over 10 minutes long, a glimpse of things to come. 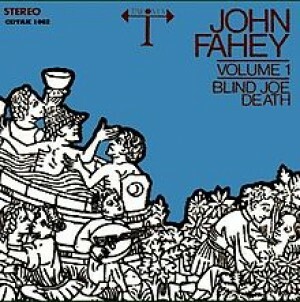 By 1967 Fahey had released a number of albums and was very successful thus it was decided that his first two albums be released in stereo; they were both rerecorded, resulting in a third version of Blind Joe Death (as above), with a new, shorter version of “The Transcendental Waterfall” and a new song, “I’m Gonna Do All I Can for My Lord”. The 1967 version received five stars in the second edition of the Rolling Stone Record Guide, however, it should be noted that the 1967 versions of Blind Joe Death and Death Chants, Breakdowns & Military Waltzes were actually recorded in mono, and briefly released on mono LP. Later in 1967, these recordings were edited to create a stereo effect and released on stereo LP with new artwork. 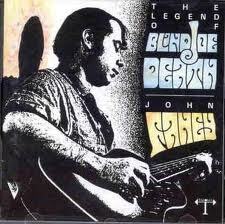 The 1996 Fantasy/Takoma CD release, The Legend of Blind Joe Death, contains the 1964 and 1967 versions of the album, with a previously unreleased 1964 recording of “West Coast Blues”, however, this CD does not include the latest ‘shorter’ 1967 recording of “The Transcendental Waterfall”, as mentioned above. 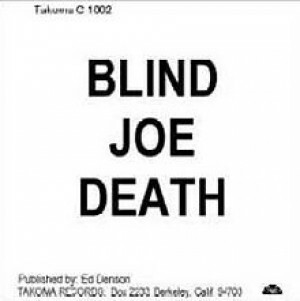 For years Fahey and Takoma continued to treat the imaginary guitarist Blind Joe Death as a real person, including booklets with their LPs containing biographical information about him including the “fact” that he had a guitar made from a baby’s coffin and that he had taught Fahey to play. Fahey sometimes incorporated the myth of Blind Joe into his performances, wearing dark glasses and being led by the arm onto the stage. Blind Joe had after all appeared again in Fahey’s 1965 release “The Transfiguration Of Blind Joe Death”. Again it was only recognised for it’s brilliance following later re-issues, it is interesting to note that the distinctive cover of The Transfiguration of Blind Joe Death is briefly focused on in a shot of a record store in Stanley Kubrick‘s film A Clockwork Orange. The jacket design and drawing are by David Omar White. 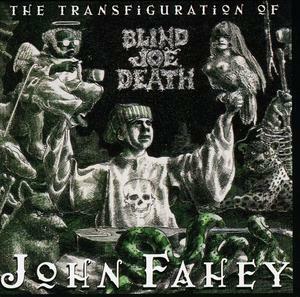 After its reissue in 1997, “The Transfiguration of Blind Joe Death” received highly laudatory reviews with often “On the Sunny Side of the Ocean” being identified as the “undeniable highlight of the album”. 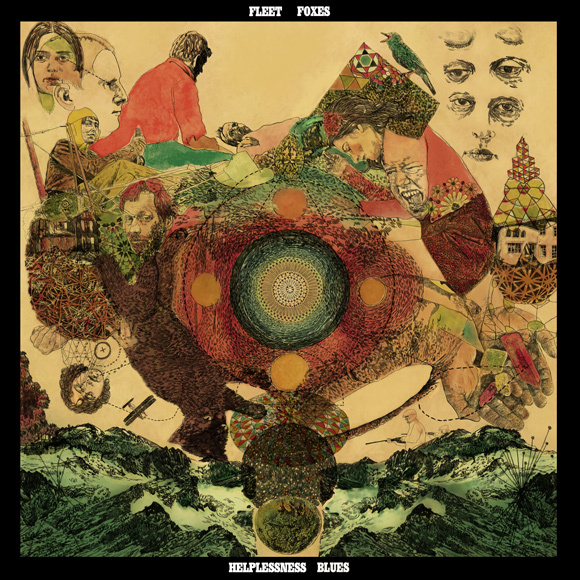 Fleet Foxes have announced the follow-up to their 2008 self-titled album. 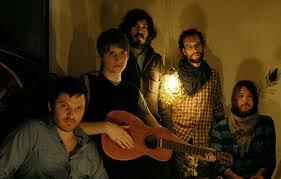 The Seattle folk-rockers will release Helplessness Blues on 2 May, followed by North American and European tour dates. 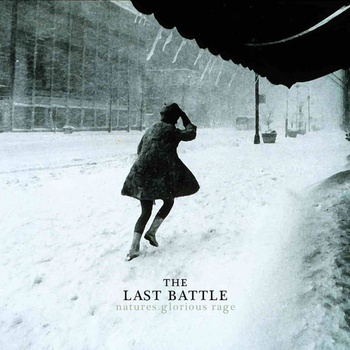 The Last Battle are a new discovery for me which has arisen from my frequent visits to the great 17 Seconds blog with whom they have signed a record deal. 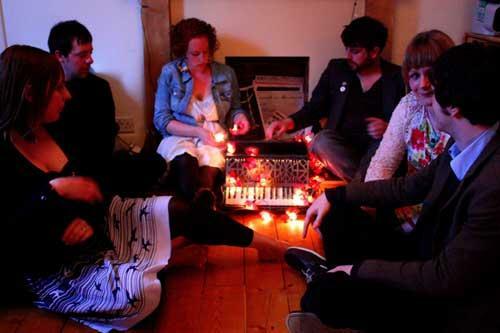 The Last Battle are a 7 piece Scottish Folk Pop band. 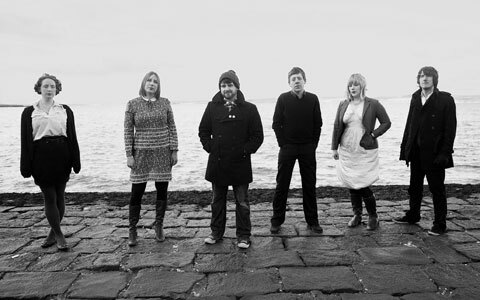 The Edinburgh based group mix traditional folk influences and instrumentation with contemporary pop melodies and boy/girl harmonies. 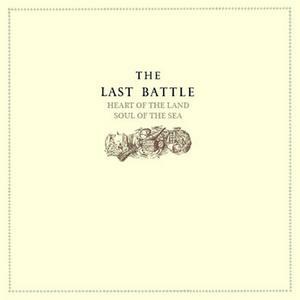 You can buy the The Last Battle’s debut album ‘Heart Of The Land, Soul Of The Sea’ from iTunes or eMusic. In the meantime you can dip your toes into their glorious water via this free download of a great track from the album. Jimmy Page is being sued by the man who wrote and first recorded the song Dazed And Confused. Jake Holmes, an American folk singer, claims that Page and Led Zeppelin infringed his copyright, as his version came out two years prior to Zeppelin’s more famous one, on their self-titled, debut album. However, even if he is successful in this federal law suit (filed in California), Holmes could only claim money owed during the past three years, due to the statute of limitations, this being a drop in the ocean to what Page will have earned from writer’s royalties. 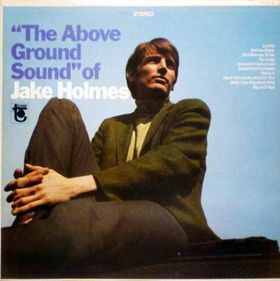 The story started in 1967 when Holmes recorded this song for his debut album “The Above Ground Sound” Of Jake Holmes. What made it unusual was the whole record was done with just bass, guitar and vocals – no drums. Released in June 1967, the album wasn’t at all well received, but on August 25 the same year, he supported The Yardbirds (featuring Page) when they played at the Village Theater in Greenwich Village, New York. So impressed were the British band with the song that they decided to develop their own version. This was a much longer one, with Page using a violin bow on his guitar. Although The Yardbirds never did a studio version of this, there have been a couple of live recordings put out. One from a French TV show in March 1968 (which cropped up on a live album released in 2000) actually has Holmes down as writing the song. 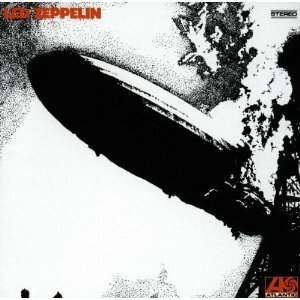 By the time Zeppelin recorded Dazed And Confused, Page had changed so much of the song – lyrically and musically – that he was credited as the sole writer. Holmes did try to contact Page, but with no luck. However, he always refused to take legal action – until now. People who appreciate blues music will readily recognise that blues music and lyrics were in the old days passed from performer to performer each time often amended in either a minor or major manner. Thus what often appeared to be variations of the same song were credited to a variety of writers. 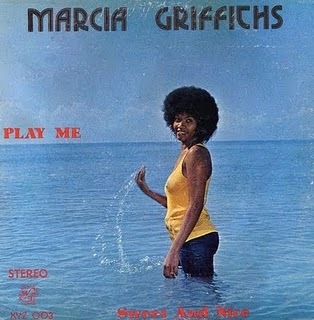 In the past copyright was difficult to determine and as such credits often refered to “Traditional” many blues writers and performers later missed out on potential royaly windfalls following the 60’s British Blues Boom. Many bands including The Rolling Stones often went to great efforts to ensure the correct writer was credited, however Led Zeppelin unfortunately have a poor track record in this respect with many blues standards sprinkled through their recorded catalogue without true credit being given. In this instance from the 60’s there can be no excuse, George Harrison with “My Sweet Lord” and The Chiffons “he’s So Fine” being another example. If Jimmy Page had any decency he would stump up without complaint and give Holmes the co-writed credit he deserves. Now the question is did Jake Holmes pinch it from someone else? 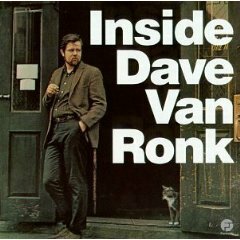 Dave Van Ronk was mentioned in passing as part of Monday’s posting therefore I thought it appropriate to end the week with something from him. 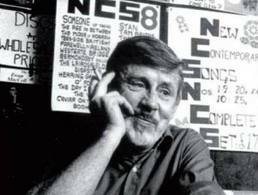 He was best known as an important figure in New York City during the acoustic folk revival of the 1960s, but his work ranged from old English ballads to Bertolt Brecht, rock, New Orleans jazz, and swing. He is often associated with blues but he pointed out at concerts that he actually had only a limited number in his repertoire. 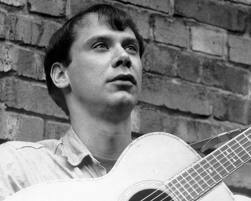 He became known for performing instrumental ragtime guitar music, and he was an early friend and supporter of Bob Dylan, Tom Paxton, Patrick Sky, Phil Ochs, and Joni Mitchell, among many others.